Sheepscot Pond is the largest pond of the Sheepscot River headwaters, and has been estimated it could support in excess of 300,000 alewives if the existing fishway is opened so these Native fish can return to their ancestral waters. Lobstermen have seen their bait prices triple in recent years; if you support their jobs, and the state’s biggest fishery by far, then it is a responsibility to be a “team player” and recognize that what is done up stream has drastic effects on us “down streamers” . Restoration of aelwives, “the fish that feeds all” could also help bring back the groundfishing industry in the Gulf of Maine, as cod, haddock, halibut all feed on this baitfish. So do a myriad number of birds and mammals, all of which help draw tourists to Maine and thus support our 2nd or third biggest source of jobs in Maine. Concerned camp owners should talk to folks on Damariscotta Lake, where a spring run of a million alewives has had no negative effects on a lake renown for it’s great bass and brown trout fishery. Webber pond residents have seen a strong decrease in algae blooms since alewives were reintroduced. There are many other ponds/lakes in Maine where residents have been very pleased with the changes, as all that is happening is restoring access to fish that evolved together over thousands of years. As for the hatchery, there are measures that can be taken to reduce, if not outright eliminate, any risks to hatchery fish. 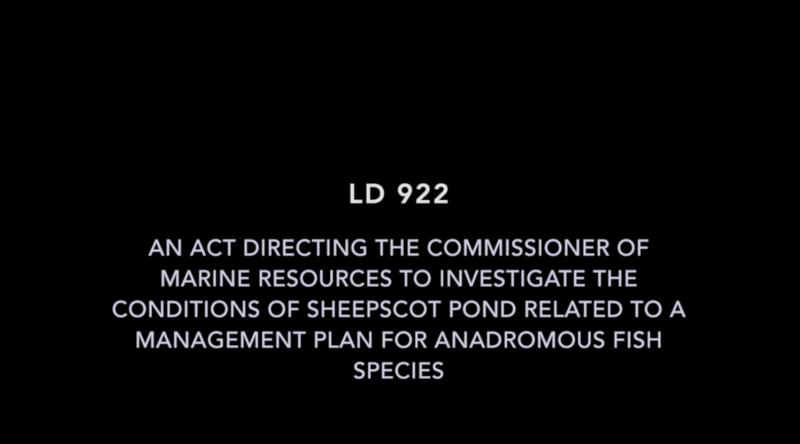 LD 922 seems like a commensense effort to ensure that the Department of Inland Fisheries and Wildlife guarantees free access by migratory fish to their natal waters. There is no scientific evidence that wild anadromous fish pose any threat to other native species, and this “biosecurity” scare is a perverse reversal where an industrial fish rearing facility where disease is often a major management problem is being used as a justification for keeping native fish from their historic home waters. In the facility the high density of fish whose fins and skin are rubbed against tank edges and become a spawning ground for a variety of fungal diseases is an environmental and biosaftey issue in and of itself. The idea that wild fish returning to their home waters could be a threat to anything is just a testament to the ways in which people have become accustomed to a deeply unnatural reality that is actively harming efforts to restore Atlantic Salmon and other species in a critically important watershed. The impact of this decision stretches far beyond Palermo, and IF&W has an obligation to represent all citizens of the state and it also has obligations to ensure that critical habitat is not limited.